We believe that keeping a “human size” is key to guarantee the success of all the children regardless of their ability or their social and economic background. That is the reason why the organization and financial model presented are based on a classes of around 15 learners. However, the context and the culture also plays an important role, and therefore, the number of students per class will vary between Connected Schools. For instance, a Connected School with 15 students per class will have around 75 students per teaching year going from primary to preparatory and ending with secondary. This will translate into around 750 learners once the school has reached full capacity and 50 teachers who are all responsible for an aspect of the school life. 30 more students will be attending the nursery and 30 more in post-16 to take the International Baccalaureate or equivalent. This concept of teachers with responsibilities is what enables a Connected School to have a very small leadership team of 2 to 3 members. Thus, the very little hierarchical separation between the leadership team and the teachers with responsibilities fosters a culture of creativity and innovation throughout the school. The school year will be divided in 6 terms of 5 to 7 weeks plus one reviewing/preparation term of 3/4 weeks in the summer. The school day will start at 8.00am for teachers, 8.15am for learners (Inc. breakfast, 8.30 without breakfast) and ends at 4pm. The day is organized around 3 to 6 periods over 4h30 of directed teaching plus one hour enrichment activities, excluding the morning and lunch breaks, the morning and afternoon assembly/tutor time, and the School Duties. The school facilities will remain opened until 6pm for learners who will wish to complete their extended learning opportunities (homework) under the supervision of CRB checked University students and parent volunteers. The teacher have 1h30min of Non-Contact Time to prepare their lessons, 1h30min for assessment (inc. electronic personalized development plans for each learners), and 1h30min for their responsibilities. 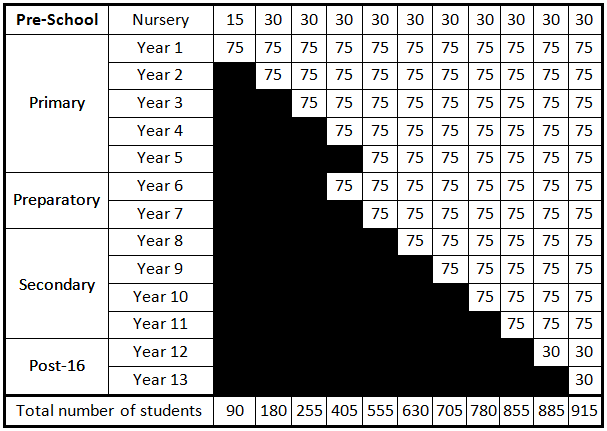 Time is allocated to arrange timetabled lesson observation for sharing good practice at least once a month to consistently improve classroom delivery and teaching performance. Each teacher is also asked to use that time to prepare a lunch time training session that will be ready to be delivered once every half term and finally to create e-learning resources that will be ready to be shared once every term. This resource can take the form of a filmed lesson that will be shared with the rest of the Connected School community and partner schools. The final step to ensure a high quality of teaching is to encourage teachers to go to performance management related CPD courses. Depending of interest, the school may operate a double entry point, i.e. Primary School (Y4) and Preparatory School (Y8) in order to enable each prep learner to mentor a pre-prep primary learner. Slightly less than half of the initial intake should choose to go for a highly academic route and apply for our Post-16 provision to complete the International Baccalaureate.